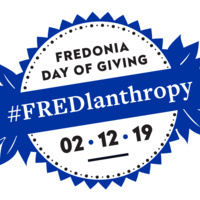 Please join us on February 12, for our annual #FREDlanthropy Day of Giving event! Your investment in Fredonia - no matter the size - is valuable. Please consider giving, and please spread the word to your classmates and friends. You can build a network of generosity that will support scholarships and programs. Provide undergraduate student scholarships and financial assistance. Enhance campus programs and student-centered services. Maintain and develop outreach programs. Upgrade campus computer hardware and software. Bring special exhibitions and performances to campus.